Top of the Town Caravan park = $27 powered or unpowered and with Top Tourist discount! 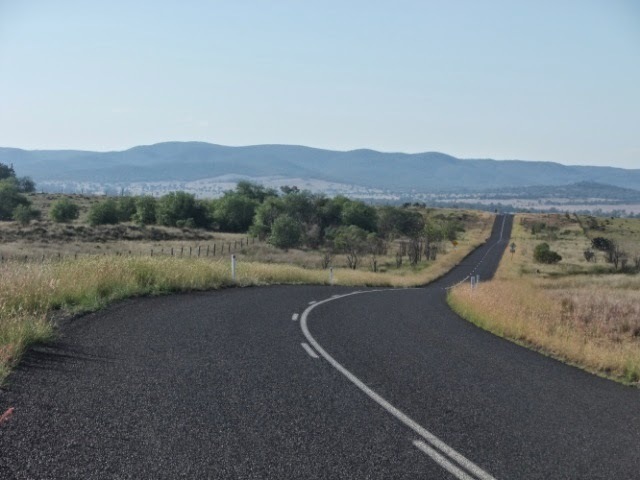 We should have taken the Cunningham highway ... with all the trucks constantly bearing down on us it would have been alot easier compared to what we have just been through the past 2 days of cycling! 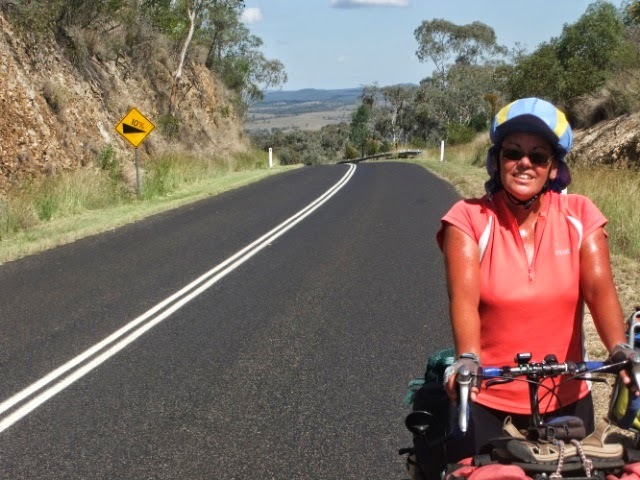 Now we knew it was going to be hilly getting to Stanthorpe but we didn't realise just how tough it was going to be ... Neil said after the first hill that we should have taken the Cunningham highway whereas I didn't agree until after the third hill! We left early at 7.30am and the road is very quiet and the first hill was a lovely gentle thing for about 6km so I thought well if it is like this then that is okay. 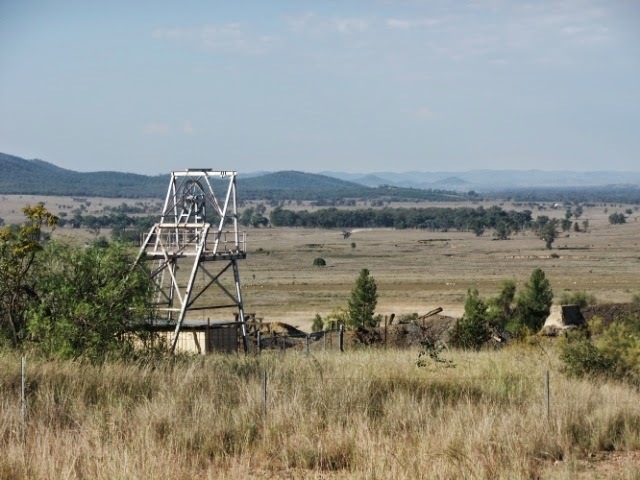 At the top you sort of cycle along a tableland for about 10km but you can see in the distance more hills and you wonder just which one is yours! I walked it but Neil managed to ride it ... he did say that the handle bar was swerving alot as he was going so slow! It was tough pushing the bike up the hill. 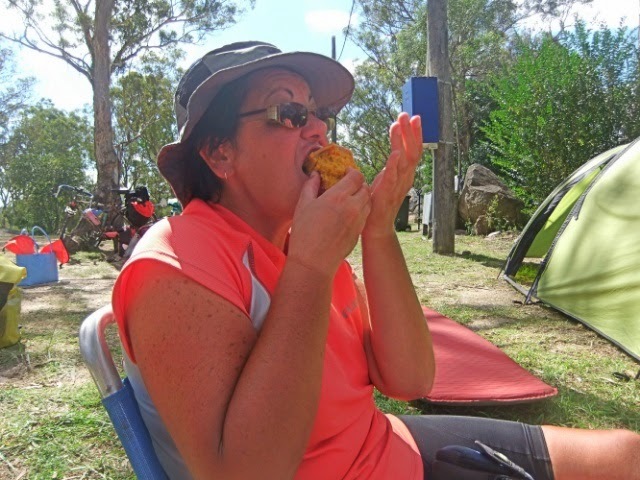 I think I have forgotten to mention that the bikes are heavier than normal as we know we can't ride the full 100km in the one day so we will have to bushcamp and there is no where to pick up water so we have to carry the extra. Also knowing that it is going to be a hot and hard day we took full capacity water so Neil had an extra 5kg of water and I have and extra 7kg of water so the bikes are very heavy and you definitely feel them on these hills. So after the 2nd hill it is up and down, up and down, up and down and so on to the third hill which is just after the turn off to Glenlyon Dam. Now the 3rd hill starts of nice and easy and is in steps with the last step at 10% .... OMG I was going to die this is the 3rd major hill like Mt Dandenong in Melbourne in less than 40km!!! Crikey I know we should have taken the Cunningham Highway now!!! and here is me at the top of the last major hill ... note the 10% warning for the downhill which is what we just came up! Not that I want you to look at my chest but I would like to draw your attention to my arms and chest as they are glistening with sweat which is just pouring off me ... on the first step of this hill a random fly decided to fly by my mouth just as I was taking a huge intake of breath and oooops down it went ... crikey did I gag ... that is the 2nd one this trip ... I am thinking of having a "swallowed fly" count on the blog! 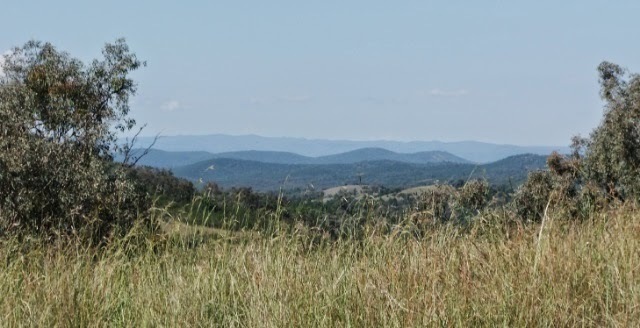 So from here at the 38km to Pikes Creek at 60km it is up and down and we are absolutely knackered, there is no flat piece of land, you are either going up or down. 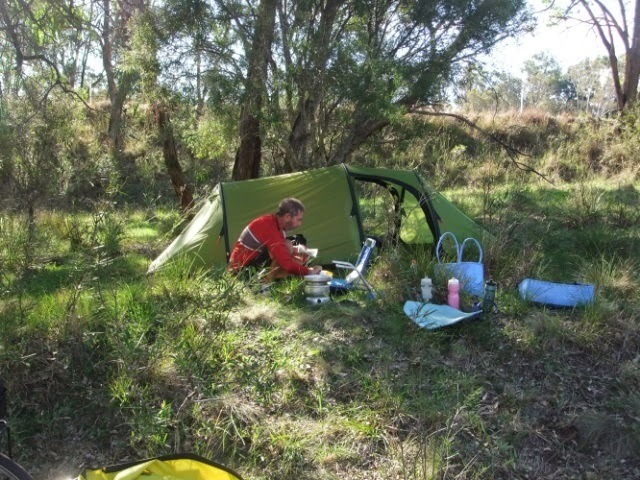 We were hoping to camp at the creek but there was no suitable ground as it was rock hard. So we decided that we would have a wash in one of the many rock pools as the sweat had dried on us and I was covered in a white film ... I could wipe off the salt that has dried on my face, arms and legs put it in a small container and use it in our cooking! We felt much better after a wash to get off all the grime ... I felt sorry for the tiny wee fish in the rock pool as once we both finished it was now a salt water pool! We found a spot to camp a further 2km on and quite frankly I didn't care where we camped as long as it was soon ... you will see a levy behind the tent - that is the road! we were close to the road but it didn't matter as there is hardly any traffic. Guess what was for dinner ... weetbix x 4 each - it is quick and easy! We did give Kouta a quick haircut and it did come out a bit like a crew cut but the weather is getting warmer so it was time for a trim ... I have forgotten to take a photo of him! We both had a great nights sleep and woke this morning and for a change had weetbix for brekky! We set off at 7.30am and we knew there would be less up and down today and more gradually going up with 2 small climbs. The traffic was more today and we don't know where they were coming from but as we got closer to Stanthorpe there were more dirt roads so we assumed they were all coming from there. 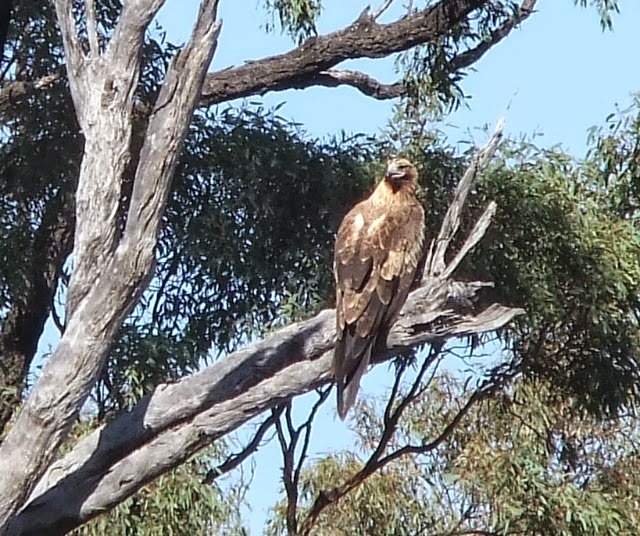 Neil saw a wedge tail eagle feasting on a kangaroo on the side of the road but I missed it when it flew off as a car came by so we stopped and waited for it but it was wathcing us and it wouldn't budge no matter what we did so this is him/her sitting in the tree watching us! 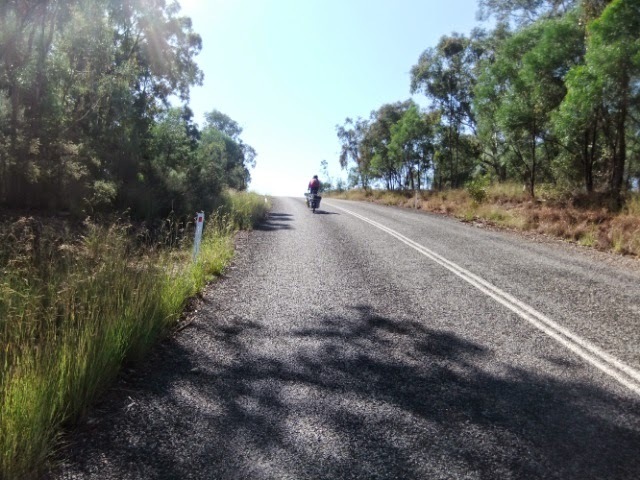 the last 15km into Stanthorpe is predominantly flattish as it is sitting on a tableland so it was nice riding in middle gear for the last few kms. Because we are coming from the west where not many people arrive from (most come from the New England highway which runs north and south) there were no tourist signs for the caravan park or information center so we stumbled across the business center and Neil googled the caravan park while I went into the supermarket to get something for lunch. I came out all SMILES from there ... I got the best thing in the bakery department ... a mark down caramel mud cake for $2 .... bargain! I couldn't shovel it down my throat fast enough!!! 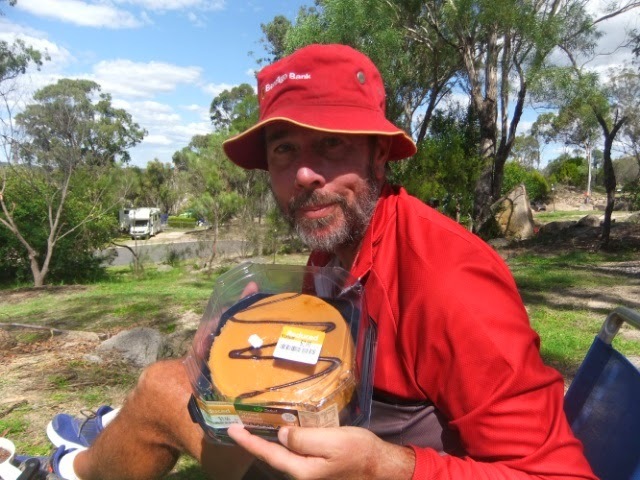 Stanthorpe is a nice town, cold in winter as it is about 850m above sea level, The caravan park is massive with over 200 sites. It costs the same for powered and unpowered and has the tourists section seperate from the backpackers section. The backpacker section is for the seasonal work which is apple picking at the moment and this will end soon and then it becomes pruning season. We didn't see any apple farms coming in so maybe they are on our way out ... or maybe it is like Young with its' cherry capital of Australia and we saw one farm ... yeah right! 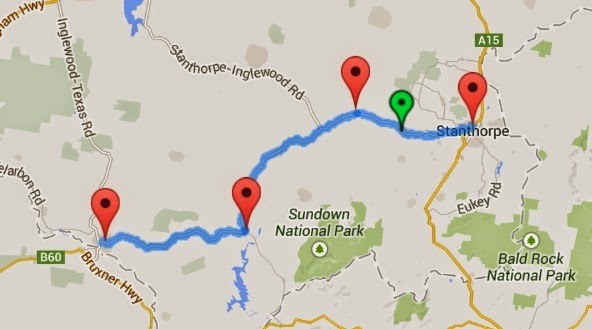 So tomorrow we go DOWN to Warwick ... actually it is a little more climbing to just over 900m and then down!